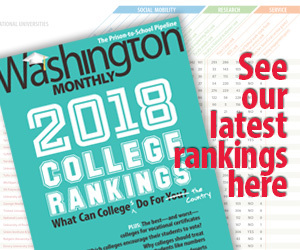 Washington Monthly | Should We Even Have Adjunct Professors? Should We Even Have Adjunct Professors? According an opinion piece in the Los Angeles Times, maybe America should just eliminate adjunct professors, college instructors who not full-time employees of the colleges, but serve as independent contractors paid to teach specific courses. The lives of many adjunct professors are ones of Dickensian misery. They usually don’t have offices, and they often don’t even have full access to libraries and copying facilities. They certainly don’t have respect. Their departmental colleagues in tenure-line positions may express compassion for their plight, but because pecking orders in academia are as vicious as anywhere else, they secretly regard adjuncts as losers who couldn’t make it in the world of tenure. So why do colleges and universities, supposed bastions of liberal compassion for the downtrodden, viciously exploit the labor of the underpaid and the overworked? Because they can. U.S. universities currently churn out more than twice as many PhDs, especially in the humanities, as there are tenure-track job openings. Universities love graduate-level programs because they are prestigious, and university professors love graduate students because they are highly motivated. (They tend to do the reading and not show up in class with hangovers.) They make useful research and teaching assistants, and graduate classes are typically tiny seminars, not huge lectures with hundreds of papers to grade. Just say no. Don’t be an adjunct. Or rather, be an adjunct only if you have a day job, or you’re retired, or if you have a family to raise and a breadwinning spouse. If you love to teach, teach high school. Or get some other kind of real job. Let the law of supply and demand do its work, because drastically reducing the supply of academic victims is the only way colleges will stop victimizing them. Does this really make sense? Well not really. One potential problem is that not all adjunct professors are getting screwed here; not all adjunct professors are cobbling together two or three gigs to try to make a living. In many cases adjunct professors are successful working professorial who work as adjuncts because the college values their expertise and they really just want to teach one class. One of my friends is an artist who taught a single painting class to students at a local community college. She had her own art to work on and also has a small child and really only wanted to teach the one class. That actually worked out pretty well. George Washington University, to cite another example, employs extensive adjunct professors. It saves the university money (though not the students) but, more importantly, it really does give students the opportunity to learn from beltway policymakers. Students wouldn’t necessarily be better off if all their professors were full time professors with tenure who also spent a lot of time on their own research. The problem with Allen’s plan to fix the problem by cutting off the supply of adjuncts is that it’s not clear how many adjuncts fall into the Dickensian misery category and how many fall into the gainfully-employed-professional-or-deliberate-part-time-worker category. As long as there are a lot of people in the second category it’s going to be pretty hard to improve the lot of those in the first. “Or get some other kind of real job.” Right, because there are totally a lot of stable, available jobs for people with master’s degrees in modern European history with 10 years experience teaching part-time at a community colleges.